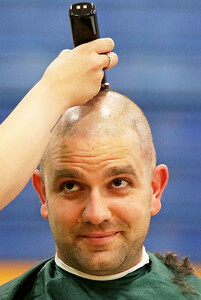 Candace H. Johnson Jen Guido, of Lake Villa, a hair stylist with Legacy Salon.Spa watches Shawn Murphy, of Grayslake feel his head after shaving his hair off during the 3rd Annual Grayslake Community Cut & Shave event for St. Baldrick’s at Grayslake Middle School. Murphy is a Life Fitness teacher and head coach for girls track at Grayslake Central High School. Candace H. Johnson Mike Przybylski, 16, of Grayslake gets his head shaved by Jen Guido, of Lake Villa, a hair stylist with Legacy Salon.Spa during the 3rd Annual Grayslake Community Cut & Shave event for St. Baldrick’s at Grayslake Middle School.Mike and his father have been participating in the St. Baldrick's fundraiser for six years. 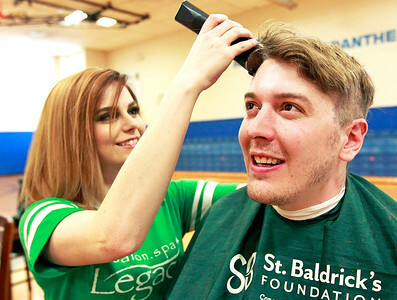 Candace H. Johnson Crystal Sepulveda, of Round Lake with the Legacy Salon.Spa shaves Mark Kettering's, of Spring Grove, head during the 3rd Annual Grayslake Community Cut & Shave event for St. Baldrick’s at Grayslake Middle School. Kettering is director of special education at Grayslake High School District 127. Candace H. Johnson Carter Lee, 11, of Hainesville gets a high-five from his mother, Leslie Peterson, after getting his head shaved during the 3rd Annual Grayslake Community Cut & Shave event for St. Baldrick’s at Grayslake Middle School. 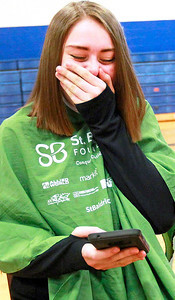 Candace H. Johnson Evelyn Bennett, 20, of Gages Lake reacts after seeing her hair with 17-inches cut-off during the 3rd Annual Grayslake Community Cut & Shave event for St. Baldrick’s at Grayslake Middle School. 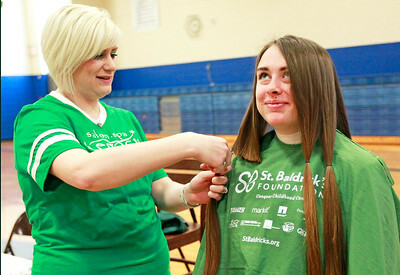 Candace H. Johnson Maggie Cassidy, of Round Lake with the Legacy Salon.Spa works on cutting off 17-inches of hair from Evelyn Bennett, 20, of Gages Lake during the 3rd Annual Grayslake Community Cut & Shave event for St. Baldrick’s at Grayslake Middle School. Candace H. Johnson Jen Guido, of Lake Villa, a hair stylist with Legacy Salon.Spa shaves Jim Plaza's, of Antioch, hair during the 3rd Annual Grayslake Community Cut & Shave event for St. Baldrick’s at Grayslake Middle School.Plaza is a social studies teacher at Grayslake Central High School. 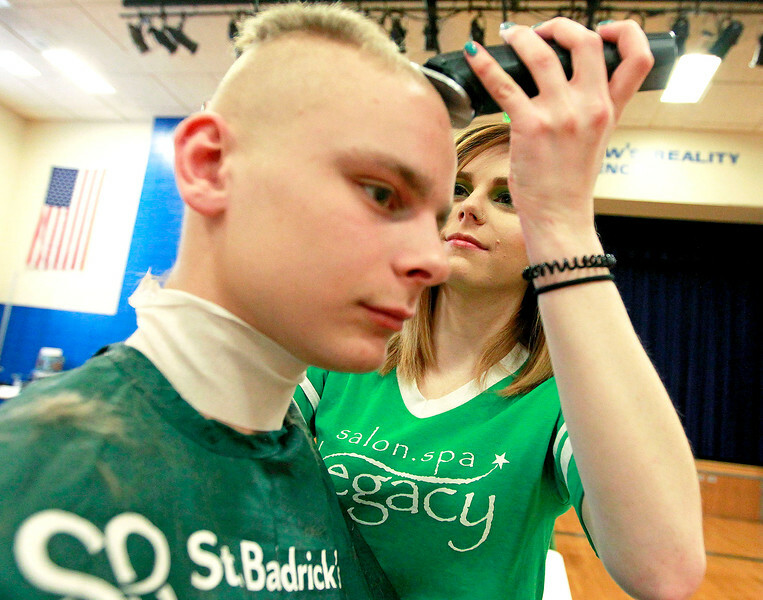 Mike Przybylski, 16, of Grayslake gets his head shaved by Jen Guido, of Lake Villa, a hair stylist with Legacy Salon.Spa during the 3rd Annual Grayslake Community Cut & Shave event for St. Baldrick’s at Grayslake Middle School.Mike and his father have been participating in the St. Baldrick's fundraiser for six years.